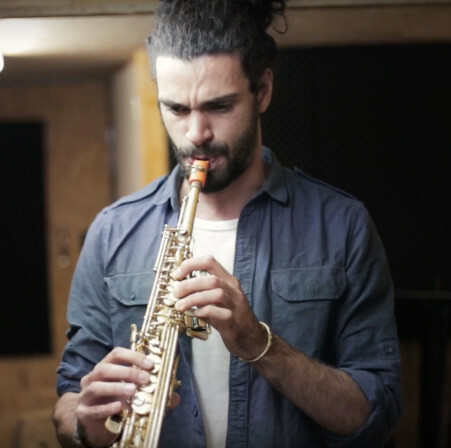 Syos soprano saxophone mouthpieces are the result of many years of research in the IRCAM labs, a worlwide famous research institute on sound and music technology. Syos signature soprano mouthpieces were made custom for great jazz saxophonists, with an internal geometry shaped at 1/100th millimeter. You can purchase one of the soprano sax mouthpiece models we created for those artists, in the color and the tip opening you want. How to choose a soprano saxophone mouthpiece? The sound of the soprano saxophone is created inside the mouthpiece. The design of this conical piece is very important because the tone quality will be a direct consequence of the mouthpiece geometrical properties.. The mouthpiece has several elements. The table is the surface where the heel of the reed stays on, it ends with the facing curve which is the curve located above the tip of the reed. The "table lenght" is defined as the lenght of the facing curve. When the table is long, the reed can oscillate with more freedom. The chamber is the zone located inside the mouthpiece, under the table and after the bore. The chamber has a strong impact on the saxophone tone quality and also the free-blowing or resistant property. There are three kind of chambers: large chambers, medium chambers and small chambers, depending on its diameter beeing bigger, equivalent or smaller than the bore diameter. Another important element of the soprano sax mouthpiece is the tip opening. It is the space between the reed and the tip of the mouthpiece. It has a strong impact on the reed vibration amplitude. The beginners start with classical mouthpieces with a lower tip opening. The sound is more direct, softer and high register is easier to access. More open mouthpieces have a bigger tip opening which often results in a richer sound. They are more powerful and flexible to play the low register. Closer mouthpieces are more adapted to classical music whereas more open mouthpieces are better for jazz, funk or world music. The baffle is one of the most important saxophone mouthpiece parts. It is located just under the reed and goes from the tip to the mouthpiece chamber. Its shape is very different from a mouthpiece model to another. There are mostly three kind of baffles: straight baffle, step baffle and curved baffle. The closer to the reed the baffle is, the brighter the sound is. Thus the sound is very dark and soft for a straight baffle whereas the tone is more mettalic and aggressive for a step baffle. The baffle design also impact the free-blowing characteristic of the mouthpiece. Durability: the mouthpiece geometry is very important for the tone quality. A bad impact on a mouthpiece can alter the shape of the rails, the tip or the facing and decrease the sound quality. A solid material is recommended. Comfort: All the materials are different in term of mouth comfort. The best soprano mouthpiece is a mouthpiece you appreciate to put in your mouth. Non-toxicity: the soprano mouthpiece is going into the saxophonist’s mouth, so it must be made from a material which is healthy for mouth contact. There are mainly four materials used to craft saxophone mouthpieces. Often seen as cheap saxophone mouthpieces, plastic mouthpieces are far from being low-quality. Syos uses ABS polymer to craft soprano mouthpieces: it’s a high quality material which is more solid and more resistant to impacts than hard rubber. Non-toxic for mouth contact, the ABS used by Syos has been certified food-safe. It also provide saxophonists with a great comfort in mouth. This material is also very good to be worked with high-tech methods such as 3D printing used by Syos. Solid and non-toxic for mouth contact, metal is appreciated by pop and funk players because metal mouthpieces have often a brighter tone. This is a question of shape more than material, as metal mouthpiece are often machined with quite a baffle. However, the major drawback of these soprano mouthpieces is the comfort. Playing outside in with a soprano sax metal mouthpiece is not recommended. Invented by Charles Goodyear, hard rubber belongs to the family of plastics. It is made with natural rubber vulcanized with sulfur and has a medium solidity. Hard rubber soprano sax mouthpieces are interesting because they are not so expensive, but their aging is not very good. The color of the material can turn from black to yellow-green because of sulfuric acid release. The comfort in the mouth, however, is very good. The wood is not used very often by mouthpieces maker, and today the best soprano mouthpieces are made from plastic or hard rubber. Some musicians like to use it for aesthetics reasons. Mouthpieces makers such as Lebayle used to make soprano mouthpieces in ebony, a black tropical african wood. The reed is made of cane. It’s the part that vibrates when the saxophonist blow into the mouthpiece. This vibration is transmitted to the air column that create the sound wave. There is usually 5 different reed strenghts, numbered from 1 to 5. For a 1 or 2 strength, the reed is very flexible and the saxophonist can play more easily, but the power is limited. For a 4 or 5 strength, the power is higher and the tone more accurate. The reed has several parts that have different impacts on the sound. The "reed tip" must be aligned with the mouthpiece tip. This part come to close the air entrance into the saxophone during the vibration. The produced tone quality is different according to the reed vibration behavior. The "spine" is the thickest part of the vibrating zone of the reed. The "heart" is another important part of the reed. A simple change in the heart shape has a strong impact on saxophone sound. Finally, the "heel" is the part of the reed fixed on the saxophone mouthpiece table with the ligature. Overall, the reed side thickness is related to the reed strength. There is no strong influence of the soprano saxophone mouthpiece ligature on the acoustic properties. Only a very picky musician with a high level of saxophone playing can feel a difference regarding comfort, tone and intonation. For an optimal compatibility in the reed laying on the mouthpiece table, the ligature has to be tightened on the reed heart. The ligature pressure on the reed can have a minimal impact on the sound. Some screwing systems tend to modify slightly the mouthpiece tip opening and thus make the sound a bit brighter or darker. Made in leather, in wood, in metal (gold, silver…) or in plastic, saxophone ligatures are hard to compare, especially for a beginner. Some of them, such as Syos ligatures, are made very simple and easy to use. In addition to their very smart reed fixation system, they are available in 14 colors, to customize your saxophone mouthpiece even more!